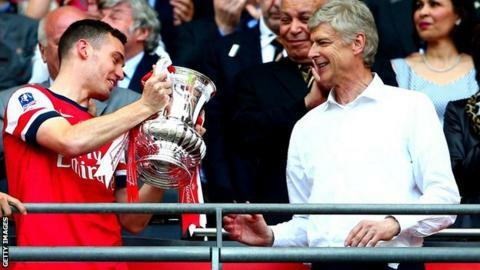 Arsenal manager Arsene Wenger says the club have received offers for captain Thomas Vermaelen and that Manchester United could be one of the bidders. The 27-year-old made just 14 Premier League appearances last season and has attracted interest from several clubs. Wenger refused to discuss the size of the bids but did say he would prefer to see the defender move abroad. When asked if Manchester United were one of the bidders, he said: "I think they could be in the group." The Arsenal manager has previously said that Vermaelen, who was part of the Belgium World Cup squad but is currently out injured, may leave the club. Vermaelen joined Arsenal from Ajax in June 2009 and became a key figure in the club's defence. However, the Belgian's form and fitness meant he made just 21 appearances in all competitions last season. "He could leave, it could happen, I've said that since the start of pre-season," said Wenger, ahead of the club's meeting with Manchester City in the Community Shield on Sunday. "He needs to play now. He has shown an outstanding attitude but he is in a position where we wouldn't stand in his way if he finds an interesting opportunity. "Ideally, yes, we would like to sell him abroad and that is an option for us. "I don't want to say how many offers we have but we have offers from abroad as well." Wenger added that winger Theo Walcott, 25, could make his return from a serious knee injury before the end of the month. The 25-year-old has not played since rupturing the anterior cruciate ligament in his left knee during Arsenal's 2-0 win over Tottenham in the third round of the FA Cup in January. "Theo is planned to come back into my group on 31 August, the beginning of September at the latest," said Wenger.